Successfully Added Ulefone U007 Android 6.0 Smartphone - 5 Inch 720P IPS Screen, Sony Camera, Quad Core CPU, Dual SIM (Grey) to your Shopping Cart. Ulefone have released their latest call phone the U007 and as you may guess form the name it's taken some inspiration from everyone's' favorite secret agent, Bond. With a high definition 5 inch IPS screen, a 1.3 GHz Quad Core CPU and 1GB of RAM the U700 brings high quality visuals and a solid performance ensuring a seamless user experience can be enjoyed by all without breaking the bank. These specs allow for a respectable performance that can handle, games, multitasking and all day to day Smartphone needs. Making use of Corning Gorilla Glass protection ensure good durability while the latest Android 6.0 operating system is fantastic value for money on an entry level device. The U007 has Smart Wake shortcuts providing an intuitive way to quickly open your favorite apps form the locked screen, great for one handed use. When it comes down to photography the U700 has plenty to offer, equipped with a SONY IMX149 camera that has 8MP resolutions and boasts 13MP interpolated images as well as an F/2.0 aperture its sure to meet impress with its high quality shots and can even record video in full HD. 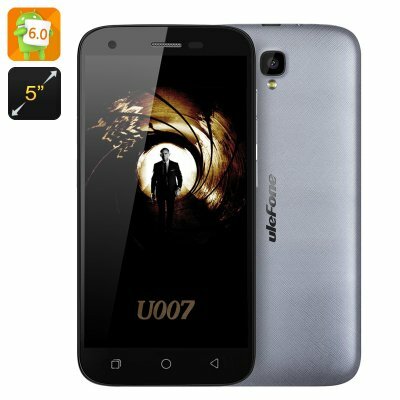 The Ulefone U007 Android 6.0 Smartphone comes with a 12 months warranty, brought to you by the leader in electronic devices as well as wholesale China Smartphones..